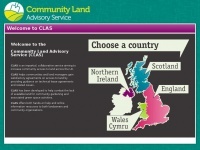 Welcome to the Community Land Advisory Service (CLAS CLAS is an impartial, collaborative service aiming to increase community access to land across the UK CLAS helps communities and land managers gain satisfactory agreements on access to land by providing guidance on technical lease agreements and related issues. A profile of Communitylandadvice.org.uk was found on the social network Facebook. The web server used by Communitylandadvice.org.uk is run by Bytemark Computer Consulting Ltd and located in Great Britain. 10 other websites are located on this web server. Most of them are provided in the english language. The websites of Communitylandadvice.org.uk are served by a Nginx server. The content management system Drupal in the version 7 is used. The markup language of the website is XHTML+RDFa 1.0. The website does not specify details about the inclusion of its content in search engines. For this reason the content will be included by search engines.